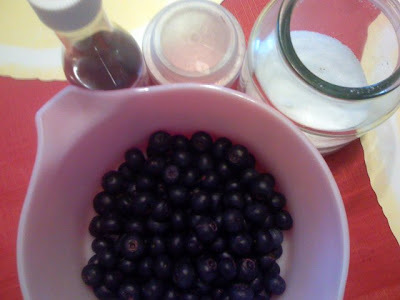 We still had a substantial quantity of blueberries left from the muffin recipe and so we decided to make a quick and easy blueberry sauce which we can use to jazz up ice cream. This recipe is so easy to make, and you can also use this procedure for strawberries. Wash the blueberries, then crush. I like to still have bits of blueberries that I can bite on however, so I left some chunky bits on it. Add the sugar and lemon juice. Mix well. Bring mixture to a boil in a saucepan, then continue boiling for a minute. Lower the heat if needed (mixture can tend to overflow when boiling). Remove from heat, then add vanilla. Then pour into a jar to cool. Pour over vanilla ice cream and serve! Use the sauce within a week. Sidney: hahaha. 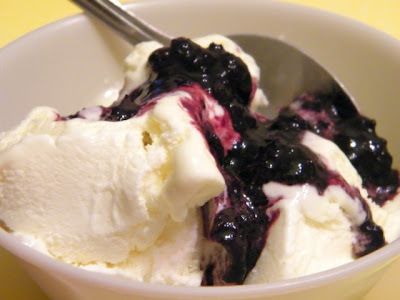 Well... they blueberries even out the ice cream?